I’ve had a lot of requests lately to do a tutorial on refilling the trulieve trupods. Its not only quick, and easy, but also extremely cost effective. Here is the Strain Slayer Certified way to save big bucks on your medicine! Lay everything out so that you can access all of your materials quickly as this process is slightly time sensitive. Pop the mouth piece out of the trupod by gripping it and prying it long ways (NO NOT PUSH AGAINST THE FLAT END) The mouth piece should pop off the side you are applying pressure to when the plastic clip unhinges from the rest of the pod. simply lift the adjacent end out and set the mouth piece aside. Now you will see a rubber stopper that is threaded through the center shaft of the pod. simply pluck this piece out with tweezers (or your fingernails ) and set it aside with the mouth piece. Now at this point you are about ready to fill the trupod! So everything is in front of you, distillate nice and warm whats Next? Within a minute of heating the syringe you are going to want to try to dispense as much of the syringe into the pod as possible. If you wait too long the concentrate will start setting back into a “thick honey” texture. A completely Empty Trupod will hold the majority of a Full 1ml Syringe if you sit around and let it all set in. I however typically just use 60-70% of mine and save the rest for other routes of administration. 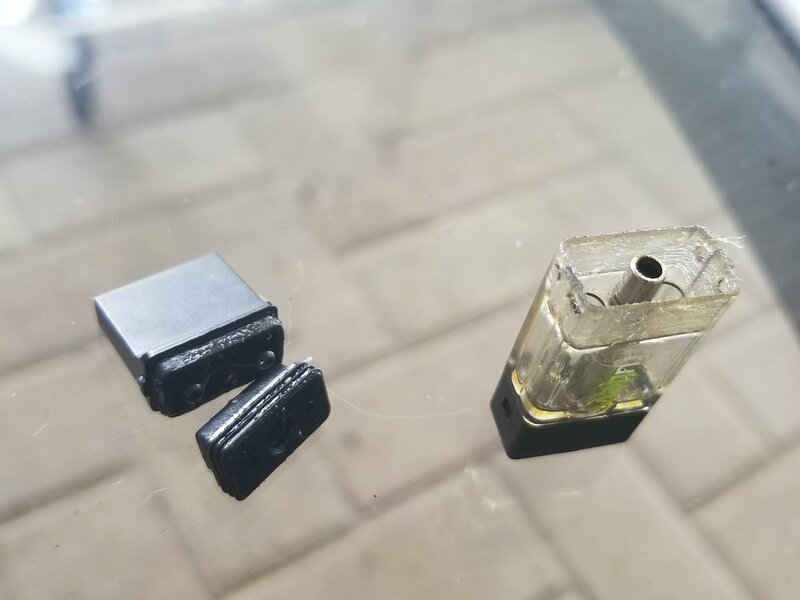 So you managed to fill your Trupod without getting distillate everywhere! Now to put it back together! The final step is very simple as long as you’ve followed the instructions above. All you need to do is reassemble everything in the order that it came undone. Priming- Replace the ( Now full) Trupod into your trustick and hold the power button for 5-10 seconds (pause) 5-10 seconds (pause) and then try drawing from it. 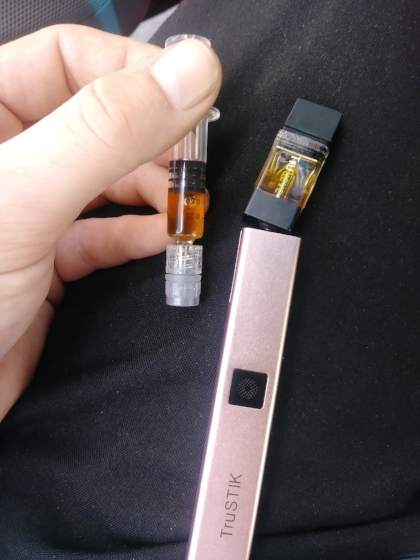 You not only just expanded your variety in concentrates you can enjoy with the ALL AMAZING trustick, You also just saved yourself`~~$30~~ on each refill! NOTE: After 3-5 refills you will need to discard and replace the pod! I hope this Tutorial was helpful. If so please share it with A Friend!